What’s better than snickerdoodles? Snickerdoodles with a caramel center! Add a few flakes of sea salt for even more delicious flavor. Welcome to Day Four of Christmas Cookies Week! 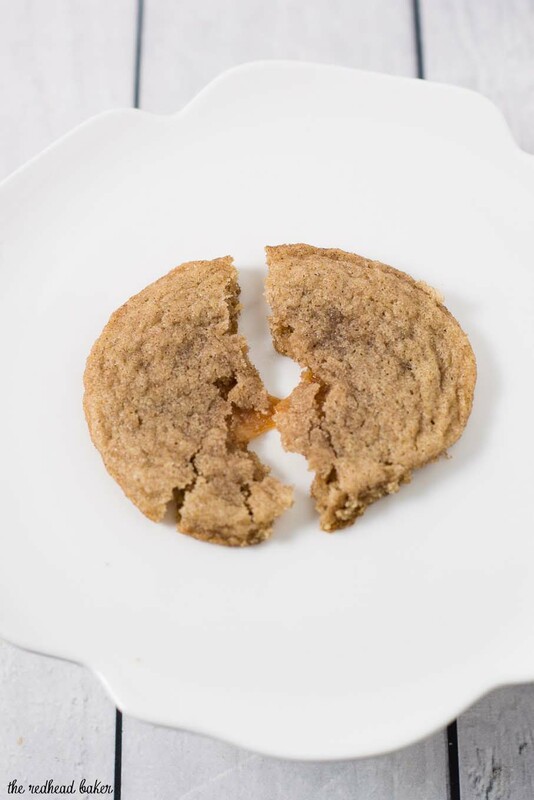 Snickerdoodles have a silly name, but they are a seriously delicious cookie. 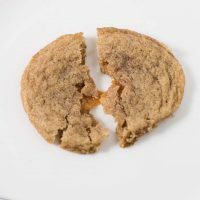 Cinnamon-spiced cookie is rolled in cinnamon sugar, then baked, which results in a cookies that’s crisp at the edges and chewy in the middle. What could possibly make snickerdoodles even better?? 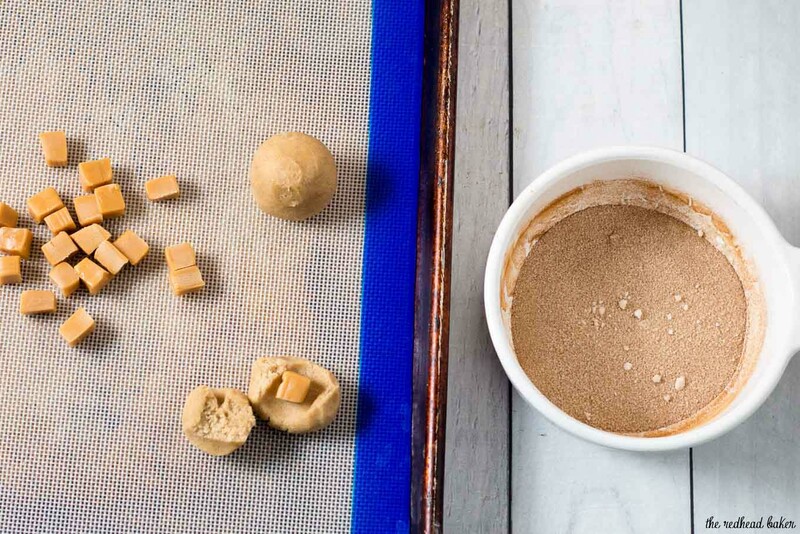 Stuffing the balls of cookie dough with chewy caramels … maybe even top them with a few flakes of sea salt. 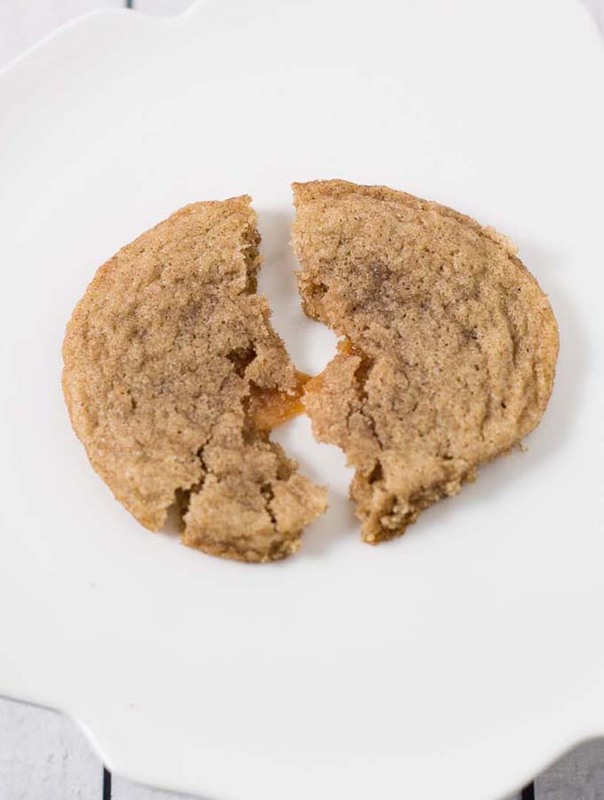 I first had a salted-caramel-stuffed snickerdoodle cookie when a dozen of them were sent to me through the now-defunct Great Food Blogger Cookie Swap. I still remember those cookies to this day, and how I couldn’t stop eating them. Christmas Cookie Week provided the perfect excuse to make a batch (or two, or three) of them for myself. 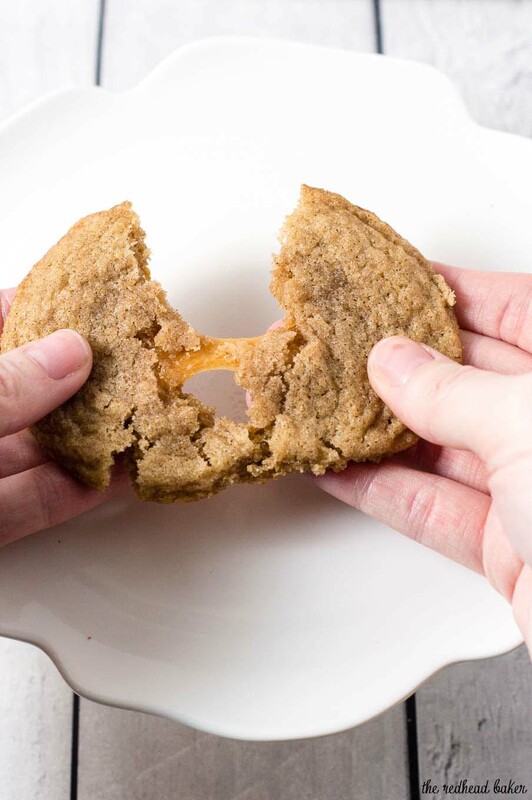 They don’t take much more effort than traditional snickerdoodles. Now, if you’re in a hurry, you can skip the chilling stage. However, you’ll get a slightly thicker cookie if you can chill the dough even for just an hour. It really makes a difference. Supposedly, you can store these in an air-tight container for up to a week, but mine never last that long! In a small bowl, stir together the flour, baking soda, cinnamon and salt. Set aside. Line two baking sheets with parchment or silicone baking mats. In the bowl of a stand mixer fitted with the paddle attachment, cream together the butter and sugar. Scrape down the sides and bottom of the bowl, then beat in the egg and vanilla extract. Add the dry ingredients to the dough and mix just until combined. Cover the bowl and chill the dough for at least 1 hour, up to 24 hours. Preheat your oven to 375 degrees F. Line two sheet pans with parchment paper or silicone baking mats. Scoop the dough with a small cookie scoop. Flatten to a disc shape. Place a caramel square in the center, then wrap the dough around the caramel and roll between your hands into a ball. Repeat with the remaining dough and caramel squares. Stir together the sugar and cinnamon for the coating. 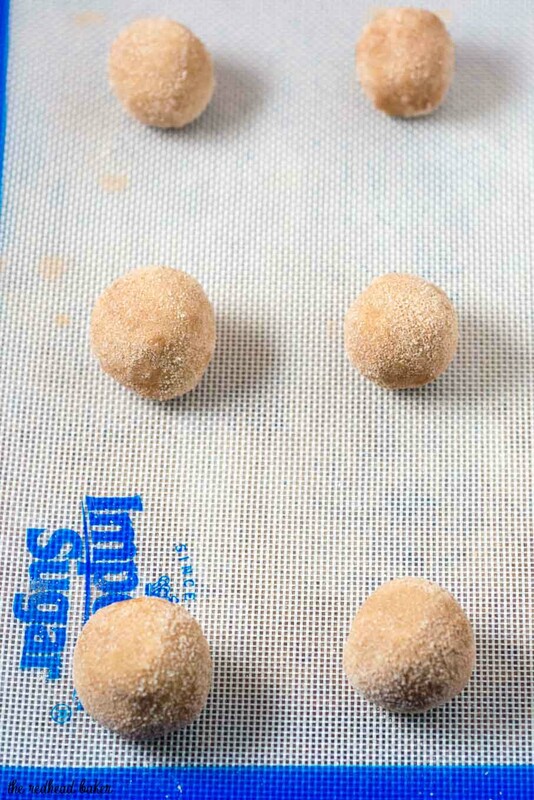 Roll each dough ball in the cinnamon sugar, and place 2 inches apart on the prepared baking sheets. Bake for 8 minutes. Cool on the sheet pan for 2 minutes, then remove to a wire rack to cool completely. See more Christmas Cookie recipes! 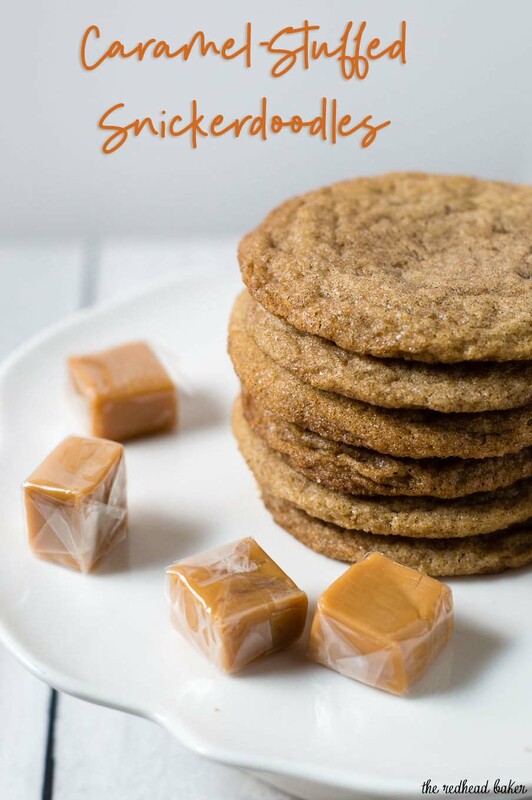 Great idea adding caramel to these cookies. What temperature should these be baked at? Sorry about that! 375 degrees F — I’ll update the recipe.